I particularly love these bacon-wrapped balls of cream cheese, pineapple, and jalapeno that I had at a party once. They were amazingly good. I can’t find them online, so I’ll have to make them for you sometime. I could have eaten an entire pound of bacon cooked that way. Well, I could probably eat a pound of bacon cooked any way. Except that bacon is expensive! When I was a kid, bacon was cheap. My parents were not extravagant grocery shoppers, but I know we had bacon. A lot. Therefore, it must have been cheap. Bacon is cheap no longer. A stroll down the aisle at Walmart, bastion of cheapness, showed me that. They didn’t even carry a “good kind”, ie nitrate/nitrite-free. All their preservative-laden bacon cost $4/ pound and more, rising as high as $7 or $8. And that wasn’t even the “good kind”. Trader Joe’s sells “the good kind” for $2.99 to $5/pound, depending on if you want pretty slices or if you’re happy with “ends and pieces”. My general point in this diatribe is that bacon ain’t cheap, no matter how you slice it. 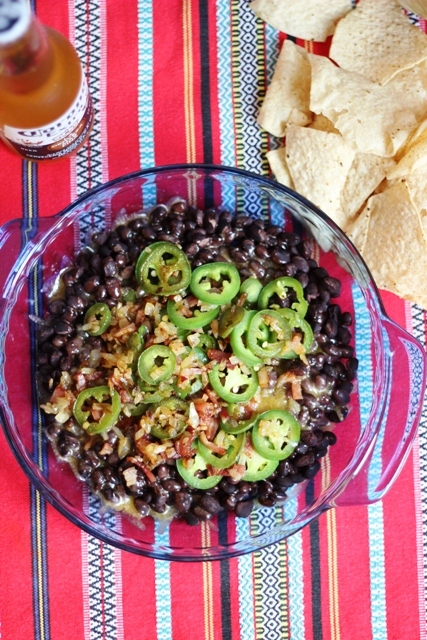 This nacho dip platter contains bacon and jalapeno chiles, just like a standard popper recipe. The flavors are there, but at a much lower cost. Since you’re only using 2 slices of bacon (1/8 of a pound), you’re reducing your cost significantly. The dish is just as smoky and spicy, but has a little twist going for it. Someone at our house ate 3/4 of the pan himself and paid for it with some indigestion later. Just like if you eat the whole pan of poppers. See? Totally the same. Share this platter of popper nachos with friends, avoid the heartburn, and enjoy a great smoky, spicy appetizer. In a medium skillet, heat the bacon drippings. Add the jalapeno and onion and cook until the vegetables are tender. Add the chopped bacon and continue cooking until the bacon is crisp and the vegetables are lightly browned. Spread the beans in a pie plate. Top with the cheese. Broil until the cheese is melted. Top the cheese with the bacon and vegetable mixture. Serve with chips. Sounds really, really good! And yes, stretching bacon is a great thing to do. We save bacon grease in the freezer and use it in place of butter or oil in stir fries and other savory dishes. It gives the taste without adding extra calories or cost. how do you figure it doesnt add extra calories? we’re talking about bacon fat right? Great idea! We made poppers last week and used Schneider’s COuntry Ham to wrap – one piece of ham covers a lot. We bought it at Costco making it even cheaper! I cimmeneted to hubby that it was much cheaper to eat poppers that way so that will be our go to next time we make poppers. Bacon is way too expensive! Do you drain and rinse the black beans before using them? Yes! Did I forget to add that part? Thanks for pointing that out. 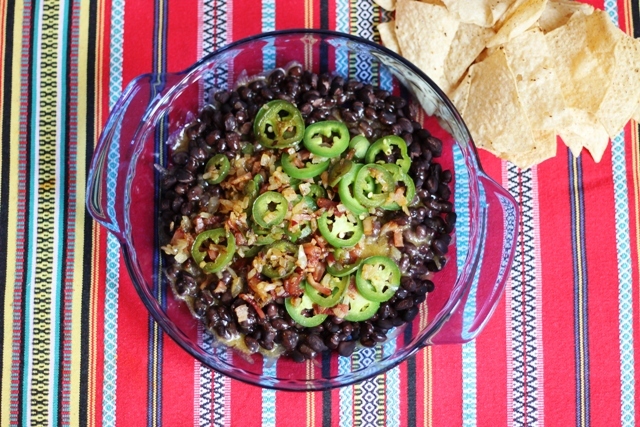 Actually, you already have an awesome jalapeno cheese dip recipe which is even better with bacon and tastes just like poppers. We love that recipe! So glad you like that one. I like it, too. Making me hungry….